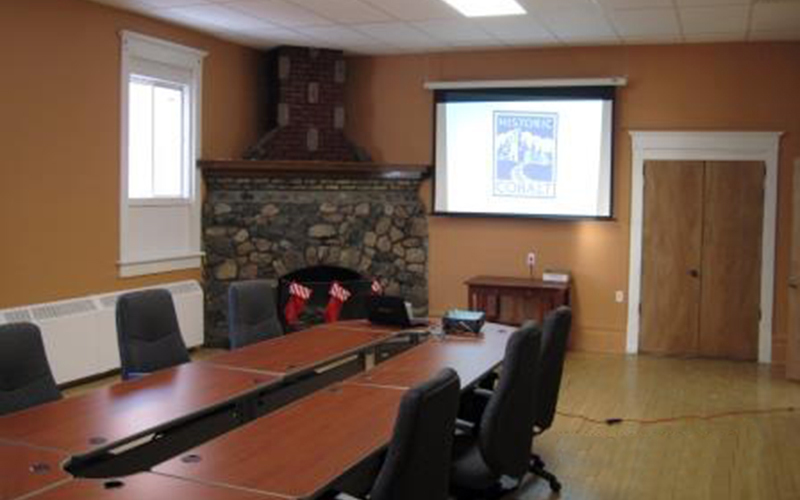 The Cobalt Business Centre is conveniently located within the Community Hall in the Town Hall office building at 18 Silver Street in downtown Cobalt. The facility was set up with FedNor’s assistance to provide a meeting space within the municipality for local businesses. It provides a flexible conferencing facility with two meeting spaces, one set up as a conference room, the other can be set up as a hall with stage. The main hall has a state of the art sound system which provides wonderful acoustics for any audience and the projection screens in both rooms enable visual presentations. Access to wireless internet is also available. A fully equipped kitchen is also available. The facility is accessible with a lift from the street level to the upstairs hall as well as accessible washrooms. Situated in the downtown core, the centre provides easy access to local attractions and businesses. Take advantage of our free to use Business Centre for your next meeting! Equipped with Wi-Fi, Video Conferencing, Screen Projection, and enough seating for up to thirty (30) people, this is the perfect venue for any size organization to host meetings and workshops.